Ahead of elections this year, the Ethiopian government is cracking down hard on any kind of free press – shutting down publications, jailing journalists and harassing their families. This is not just Ethiopia’s problem, however. As the home of the African Union, and as an oft-punted role model for African development, Ethiopia’s censorship problem is Africa’s too. By SIMON ALLISON. It’s not easy being a journalist in Ethiopia. In fact, it is nearly impossible, according to a new Human Rights Watch report that documents the scale of the state’s censorship apparatus. As journalists ourselves, it makes for highly disturbing reading (and once again highlights why the South African media fraternity’s fight against the proposed secrecy bill is so important – the distance between that and the Ethiopian situation is not so far as one might think). The authors of the report spoke to 70 Ethiopian journalists, many in exile, who painted a dismal picture of the state of Ethiopian media. The government exerts control in many different ways – some subtle, some quite the opposite. This is bad news for Ethiopia, of course. It is rarely a good sign when a government attacks the press – as South Africans in particular we can appreciate the dangers of a single, state-sponsored narrative. But it is also bad news for the continent as a whole. The Ethiopian capital Addis Ababa is home to the African Union, the continental body tasked with driving African development and righting the continent’s many wrongs. This makes it the de facto African capital, a hub of diplomatic intrigue; a place where important people meet to exchange secrets and conclude deals; and the centre around which so much of Africa’s politics revolves. If we want to know what’s happening in Africa, we need to know what’s happening in Addis Ababa. Without a free press, we can’t. How else are we going to figure out what exactly our leaders are up to? They are certainly not going to tell us themselves. It’s not just media, either. Ethiopia keeps a close eye on NGOs and think tanks working in the country too, even those with continental mandates, and has the power to grant or deny access to the African Union by manipulating visas – if you don’t get a visa for Ethiopia, you don’t get to visit the AU. This makes researchers and advocacy organisations very wary of being too critical of the current Ethiopian administration, even when they shout loudly about the failings of other African governments. This means, ultimately, that we are getting a distorted picture of the Ethiopian story – and the Ethiopian story is a vital one in the context of African development. Ethiopia, along with Rwanda, is advocating a very specific developmental model, one that prioritises economic growth and socio-economic rights ahead of liberal luxuries such as democracy, participation and human rights. The theory is that it’s ok to silence opposition and crack down on media as long as the government is improving employment, education, health, etc. The figures suggest that this model might just be working. Ethiopia’s GDP is growing at about 10.4% while over the past decade, the country has registered statistically significant growth in the welfare, education and health categories of the Ibrahim Index of African Governance. But can we trust these figures? A recent example from Rwanda, where free press is also non-existent, is instructive. On 15 January, David Himbara, a former economic adviser to President Paul Kagame, explained in an op-ed on Quartz why he quit his job. “I resigned not only because he was tyrannizing the nation, but also because he asked me to tamper with the truth about the economy,” he said. Himbara argues that the apparent successes of Rwanda’s model for economic growth are illusory, and based on poor or deliberately misleading data. But in the absence of a free press, or a free civil society, this data goes unchallenged, and the Rwandan model is hailed as a success and eyed by other African leaders (especially those with an authoritarian streak) as a role model for their own countries. So too with Ethiopia: without anyone to tell us otherwise, Ethiopia’s development approach looks like it is working, even if it’s not (this is not to judge this approach one way or the other, just to observe that in the absence of any kind of independent information we cannot gauge its effectiveness). 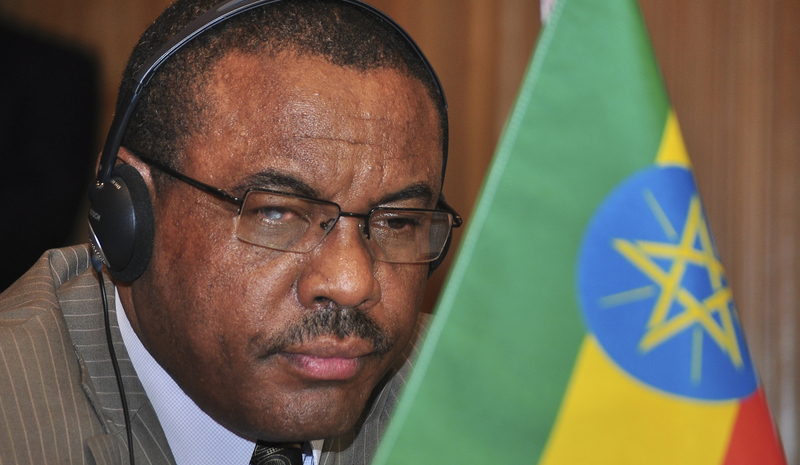 Photo: Prime Minister of Ethiopia Hailemariam Desalegn attends the Meeting of the Peace and Security Council at the African Union Headquarters in Addis Ababa, Ethiopia, 29 January 2014. EPA/DANIEL GETACHEW.